Before the 1968 Formula One season began, the teams in those days competed Down Under in the Tasman series, which Lotus and Clark won hands down, finishing first in 5 of the 8 races, giving momentum to the 1968 season. In the Australian races, for the first time, Lotus used the red and white Gold Leaf livery of Lotus's tobacco sponsor Imperial Tobacco: the world was changing and Colin Chapman, typically, led the way. On January 1st, 1968, the Grand Prix season officially got underway at the South African Grand Prix, again held at Kyalami. Lotus was back in its green and yellow livery for this race and Clark and the Lotus 49 took up where it left off in Mexico City: Clark was on pole, led from lap 2 (Jackie Stewart having led lap 1) and set fastest lap, securing Clark's 25th Grand Prix victory, his last one, and one more than the redoubtable Fangio had achieved. Graham Hill and the Lotus 49 would go on to take the Drivers' and Constructors' Championship for 1968 but Clark would not be around to share in the ultimate success of the driver and car combination he had made so famous. Nor was Clark ever to run another Indy 500, although there are rare pictures of Clark in March 1968, just a month before his death, at the Indianapolis Motor Speedway in the STP Lotus 56 Four Wheel Drive gas turbine car that he and Parnelli Jones, his former adversary, had originally planned to drive in the 1968 Indy 500. 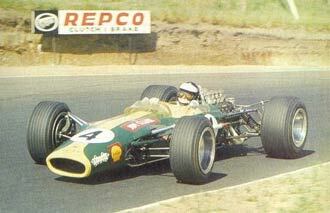 On April 7th, 1968, at Hockenheim, Clark was entered in a Formula 2 race in his Lotus 48; the car was again in the red and white Gold Leaf livery. Also entered in the race were a variety of notable drivers: Jean-Pierre Beltoise and Henri Pescarolo in Matra MS7's, Piers Courage, Derek Bell, Picko Troberg, Chris Lambert, Kurt Ahrens, Jr., in Brabhams, Clark and Hill in the F2 Lotuses and a driver named Walter Habegger was running a 1966-vintage Lotus 41 F3 car. Interestingly, Max Mosley, now the President of the FIA, was also in a Brabham for what was to be his first Formula 2 race and thrilled to be on the same track with his heroes. Chris Amon and Jo Schlesser were also in this race. Today, a Formula One driver would not be found competing in lesser formulas, but in those days it was quite common, as can be seen from the list of competitors. 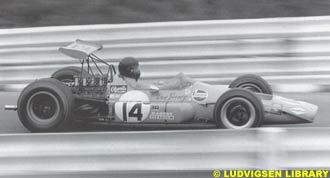 And the Lotus 48 Formula 2 car was a new car and it was important to Lotus that Clark should showcase it. 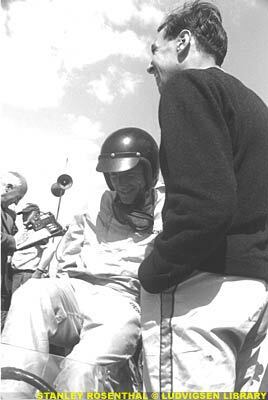 Clark did have another race potentially available to him, the BOAC 500 Sports Car Race at Brands Hatch on that same Sunday, but ended up staying committed to Hockenheim. Prior to the race there was a picture taken in front of the pits at Hockenheim that typifies Jimmy Clark and the close relationship he developed with his mechanics, something later World Champions like Ayrton Senna and Michael Schumacher also fostered. In the picture, Clark is all suited up with his helmet on standing on the grid next to his car the ill-starred Formula 2 car, carefully holding a funnel for the mechanic who was pouring gas into the Lotus gas tank which was located just ahead of the cockpit. Clark's unaffected manner and the casual nonchalance that was one of his main character traits comes through in one of the last pictures ever taken of the Great Scot. On the one occasion when I had the good fortune to meet Jim Clark myself, it was under similar circumstances, hanging out late at night watching the mechanics work on his car at the garage on the top of the hill at Watkins Glen, the night before the 1964 U.S. Grand Prix. It was just Jimmy and me, two guys stuck in upstate New York on a Saturday night without a date. 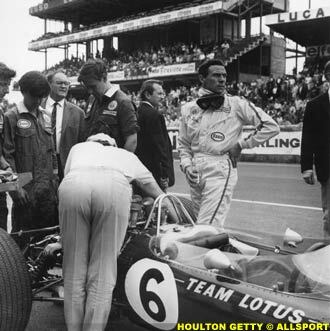 And that night I saw the same Jim Clark portrayed in the picture at Hockenheim: studiously interested in what the mechanics were doing and watching them as they prepared the cars but not interfering with them or marching around giving them orders. Most importantly, Clark had the time to talk to an American teenager on that Night To Remember. But back to sadder times at Hockenheim. During practice, Clark was not happy with the car or the race conditions. First, the fuel metering unit acted up and he missed the initial practice session. Second, once he got to practice, Clark, who had never before raced on the Hockenheim track, spun the Lotus 48 in the stadium section of the track and pitted to check the brake balance. Third, although the morning rains had eased up by race time, the track was still wet as the race got underway and the car was fitted with new compound Firestone wets. Another aspect of the day that was different for Clark was the absence of Colin Chapman, who was not at the race on Sunday but was instead en route to St. Moritz for a family holiday. Eighteen cars started Heat 1 of the race and pictures show that it was a dark, misty, overcast afternoon. The French Matras shot into the lead and Jimmy managed to linger about in fifth place in his Lotus as the Brabhams and the Matras swirled about him. In the early laps, positions continued to shift but Clark was falling back. In one of these early laps, the older Lotus 41 of Habegger crashed into an earthen bank near the stadium grandstands located before the main straight at Hockenheim; Habegger had also crashed the day before, breaking his crankshaft and some, like Colin Chapman (who, as indicated, was not at the race), speculated that Jimmy may have driven over a fragment of metal from that Habegger incident the day before. Clark began lap 5 in eighth place, and he was out there running all on his own; Chris Lambert had passed Clark on lap 4 and was out ahead of Clark; behind Clark was Robin Widdows, but apparently not close enough to see the accident. Based upon a lone flag marshal's report, it appears that after Clark left the main grandstand area and was heading out into the wooded area and the long straight, the Lotus twitched one way, then the other, before veering off across the road and into the trees, the center of impact being at Clark's left elbow, right where the No. 1 was painted on the left side of the car in its white rondel. According to the official report of the accident, the marshal said he had seen the car start breaking away at the rear end while it was still coming towards him and that he had nearly been hit by the car before it began a series of breakaways and oversteering corrections that continued until the Lotus hit the tree. Clark's accident happened in a non-spectator area and it took some time for other drivers and the fans in the grandstands to learn the enormity of what had occurred out there in the forest. As Max Mosley remembers it 32 years later: "I just remember seeing the ambulance parked off to one side of the track [and thinking that] someone had obviously gone into the trees. I also remember catching Graham Hill and overtaking him, which was one of the high points of my career. It was wet, the tires on the two Team Lotus cars were inferior to the ones I had, so it had nothing to do with skill . . ." The ambulance was sent out, as Max Mosley recalled, but Clark reportedly died before he reached the hospital and a light went out in the world of Grand Prix racing that has never really been rekindled. But while Jimmy Clark had now shuffled off his mortal coils, more tragedy awaited the living at Team Lotus in this somber year. Ironically, a month before Clark's death at Hockenheim, when the only worries at Lotus were business and financial, Colin Chapman and Andy Granatelli had a muscular exchange of threatening letters over the 1968 STP-Lotus Indy 500 effort. In order to conclude matters, Granatelli had written a long letter to Chapman in late March 1968, attempting to smooth things over between STP and Lotus pre-Indy, which ended with the following plea, especially poignant in light of subsequent events: "Let's make racing fun from here out." But instead of fun, more bad news was to jolt the Lotus team a month to the day after Jim Clark's death from half a world away. Mike Spence, an English driver who had been Clark's teammate on the Lotus Grand Prix team and a friend of Jimmy's dating back to their days in Formula Juniors, had been recruited to take over Clark's Lotus 56 wedge-shaped car at Indy, the car that was dubbed the "flying doorstop". The ultimate three-car STP team was to be Graham Hill, Jackie Stewart and Mike Spence, a dream team that never worked out and instead turned into a nightmare. On May 7th, 1968, Spence was trying out one of the Lotus 56's, to determine whether the slow times being set that day were due to the car or to the rookie driver, Greg Weld, whose times were off considerably from Spence's. 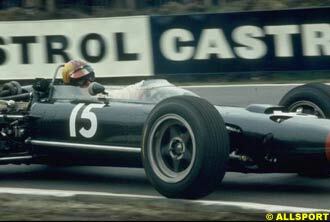 Earlier, Spence had set the fastest lap of the day at 169.55 mph in his own Lotus 56. After turning a couple of laps at 163 mph, Mike entered Indy Turn 1 too high, lost control and crashed into the wall at a 45 degree angle, after skidding 300 feet, his head being hit violently by his right tire which was flung toward him by a dangling traction bar. Spence was unconscious and died later on of his head injuries at Methodist Hospital in Indianapolis. How good was Mike Spence and his assigned car? The time he set of 169.555 on the morning of his death was faster than the 169.507 set by pole sitter Bobby Unser, on the first day of qualifying. "I am filled with grief at the loss of my long-time friend and associate, Jimmy Clark, and the additional loss, just a month later to the day, of Mike Spence. As an understandable result, I want nothing more to do with the 1968 Indianapolis race. I just do not have the heart for it." And in that, Chapman spoke for all of us who had the privilege to watch and marvel at what he and Jimmy Clark had accomplished throughout the 1960's in the spindly green and yellow Lotuses of the 1960's, only to see it all dashed away in a violent moment on a rainy track at Hockenheim. Hockenheim Post-Mortem: If It Could Happen to Him What Chance Did the Rest of Us Have? How and why did Jimmy Clark die? Pictures of the accident scene show the tub of the F2 Lotus after it was partially wrapped around a tree: for all the world, the truncated Lotus looks like the cockpit and front cowling of a Cessna 152 airplane, with the roof cut off. The steering wheel protrudes high above its usual position having been pushed back and up during the accident. As was the case when Ayrton Senna died in his Williams at Imola on May 1, 1994, most Grand Prix fans automatically assumed that the accident was the fault of the car - the known-to-be-fragile Lotus - because Clark (like Senna) was just too capable a driver to make a mistake of the kind it took to lead to his accident. As Ferrari Grand Prix driver Chris Amon put it so eloquently: "Beyond the grief there was also a fear which we all felt. If it could happen to him, what chance did the rest of us have. It seemed that we'd lost our leader." In Senna's case, after criminal trials in Italy and the availability of telemetry and application of modern forensics to the facts of the accident, there is still no consensus as to what caused him to go off at Tamburello that Sunday, although the immediate cause of death seems not to have been the crash but a suspension upright which penetrated Senna's famous yellow and green helmet and ultimately caused the head injury from which he died. "As soon as a side load is put on [a cut tire], in cornering, the tyre becomes unstable, and cannot generate the cornering force that the driver would expect. With the right-hand rear tyre deflating, the effect in a right hand corner would be some oversteer. Correcting this by steering left would put a heavier cornering load on to the unstable right-hand tyre, which would give rise to a fairly vicious right-hand oversteer. Correction in the opposite sense, at high speed on a very wet track, would clearly be difficult. The tachometer in the car, a mechanical type, indicated that Jim had the power on right up to impact, clearly trying to hold the car. There are, however, situations in which even the unearthly skill of Jimmy Clark will not suffice." Call me a Clark fanatic or a conspiracy theorist, but that last sentence just does not sit well with me, putting too much blame on Jimmy Clark and almost completely exonerating Lotus and the Firestone tires. Think about it: if you have one of the following three people or entities to blame for a fatal accident in a Grand Prix car and you have Lotus, Clark and Firestone to choose from, which way would you lay the odds? It should be noted that Peter Jowitt was also called upon to examine Jochen Rindt's Lotus 72 at Monza after his fatal accident during practice for the September 6, 1970 Grand Prix. There is also controversy surrounding that accident, where Rindt was running in an experimentation mode without winglets on the front of the car, when the brake shaft broke under maximum braking and the Lotus 72 hit the Armo barrier. After reading Jowett's report, I am left with an eerie mental image: Jimmy Clark in the cockpit of the red and white Lotus, at full power on a fast curve on a wet track and down in eighth place in the race, trying every one of his considerable bag of car control tricks to finesse his way out of what he must gradually have recognized was an uncatchable spin even for his lightening reflexes. In my mind's eye, I see him trying desperately to find the grip or a gap to escape once again from a near thing as he had so often done in the past from Scottish club racing circuits to the Indianapolis Motor Speedway to the Eifel Mountains. I see him feathering the throttle, watching the rev counter and sawing away back and forth at the little leather-covered Lotus steering wheel. I see him experiencing the horrible, sickening feeling in the pit of his stomach that he must have felt in those milliseconds as he fiercely fought the slide across the wet track, and through the wet grass and the mud before finally crashing into the tree, dawning on him in the last fraction of a second that this time it would hurt Big Time, with his foot still to the floor, insolently in some sense flying in the face of physics to the end as he so often had done before so spectacularly. And then I think of him at the moment of final impact, the cockpit side panels having given way on impact and crushing in around his body, the steering wheel coming up at him, the car lodged against the sapling it hit, trapped in a coffin painted like a cigarette pack, breathing the last breaths of his thirty-two years and probably working out in his remaining moment of life how he might have handled that spin differently. Today, there is an Armo barrier on the curve at Hockenheim where Jim Clark died, something that, according to Peter Jowett, would have prevented the kind of tragedy that happened that day to Jimmy Clark. The trees where Clark's car went in are still there 33 years later, accompanied now by a small stone cross with the simple inscription "Jim Clark 7.4.1968" on it, marking the spot where Clark's sad and untimely death took place. He has now been away from us for as many years as he was with us. As an American, 1968 was full of tragic deaths for me, as hero after hero was mowed down before their time. Although it may seem incongruous to lump this particular trio together, their deaths all affected me: Martin Luther King Jr., on April 4th, 1968; Jim Clark, on April 7th, 1968; and Robert F. Kennedy, on June 8th, 1968, then a Senator running for President of the United States. These dark times truly mark the days when the music died for many Americans. I found myself turning away from both Formula One and politics during that time as my way of dealing with these losses. "A year has passed and my thoughts are with Jimmy as so often during the past season. I miss him very much at all the circuits and I ask you to please accept my sincere feelings of sympathy in these sad days of April. Sincerely, Dan Gurney." If Clark had lived, I like to think that Gurney and Clark would have remained friends all these years later, perhaps reminiscing from time to time on Speedvision or on ITV with Murray Walker on their years together in the Golden Age of Grand Prix, perhaps having just made a special joint appearance at the Indianapolis Motor Speedway for the Inaugural U.S. Grand Prix in September 2000, given their strong connections to the Speedway.